The biggest changes have been to an Auto-Linea aluminum case, 7.8 C/R, water/methanol injection, a better design breather system, and changes in the fuel-ignition maps. I inject the water/methonal at 5 PSI when using pump gas. I inject the water/methonal at 12 PSI when using race gas. The CHT ranges, depending on load from 225F to 325 F. The current induction air inlet temps are 60 F. above OAT in vacuum mode. I recently ran 27-1/2 PSI boost at Drag Day. Did 99.09 in the 1/8 with the tires spinning in first (1.62 60') and clutch slipping during the speed shifts and slipping way into 3rd gear. I backed the boost down from that pass to 25 then 23 PSI. Used VP C-16 fuel. The header has 21,500 miles on it, over four years of age and made from 321 S/S, 1-1/2" OD. I got the idea from CB Turbomania book on page 158. At the time I thought this configuration was best to suit my needs. 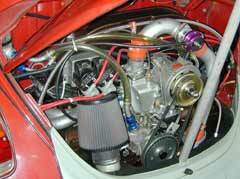 I had the wastegate on #3 cylinder for while and it over scavage that cylinder and also had boost creep. I moved it to the collector and it works great. I got Marty Staggs involved with my bug by adding extra supports to my JCL cage to the torsion housing, he made me a custom scatter shield for my 091 trans, welded my Berg frame horn mount to the horns, welded the Proformance torque bar brackets to speical adaptor brackets that bolt to the Berg craddle mount. Welded my Burns muffler to larger dia. pipe out of the turbo. When I had this header made I was using a type 1 trans, now with the type 2 trans it moved things up, back and over to the passenger side. So I had Marty redo the #2, 4 pipes to clear the EFI appron. There is only 1/4" of clearence from the heat blanket. The reason why this header looks funky is that everything fits under the tin, decklid, appron, and has to go around a traction bar and 3.5 qt. Berg sump. I got 50 pounds of crap in a 50 pound bucket but it all fits and works. The apron is removable, I drilled out the spot welds that hold it in place. I have three bolts on each side plus the two fender bolts each side that keep it inplace. Remove the bumper and the bolts and the apron comes out. I just drilled out the spot welds, but first you need to remove the fenders to see where they are at. Also the apron is welded at the top where the decklid sits on, you need to make a small hacksaw cut just deep enough to cut through the weld but not through the side body panel. After it is off, re-install the apron and drill 3 holes on each side through the fenders, side panel and apron. Drill one hole at the bottom just above the fender bolt, use a 8 x 1.25 bolt, for other two bolts use 6mm bolts at the middle point and top point where the metal folds over to the side panel. With the three bolts on each side, plus the fender bolts, the apron will stay in place without the use of tabs that stick out. When I remove the apron, I first remove the traction bar, bumper with brackets, the six bolts on each side, lift out the fender beading above the taillights, then the apron will come out with some finessing. I have some aftermarket extruded aluminum rails that are tapped for AN-8 thread. I bought the rails from B&B German Auto in EL Monte, CA. They are taped for straight thread, so the AN-8 union screws right in, and you use a 0-ring to seal. 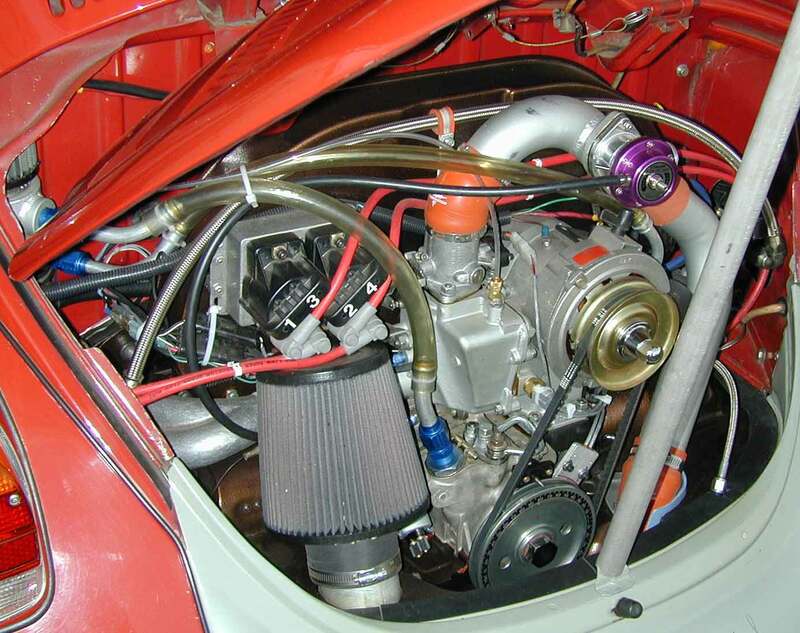 The turbo is a T3-super60, 1.900 inducer, .48 A/R stage II trim, exducer 2.122, and I use a SDS EM 2F injection system. I run a Turbonetics Deltagate with a 9 pound spring and a Greddy blow off valve. The bus transmission gear ratios are: 4.57 R&P, 3.33, 1.75, 1.09, 0.77 I do 6.90's @ 98 mph in the 1/8 mile in third gear = 6300 rpm's. I do 10.90's @ 122 mph in the 1/4 mile = 5500 rpm's. Now I have a 70 shot NOS system and a stage 3 clutch (hope it holds) and at 6000 rpm's = 10.10 @ 132 mph. UPDATE: The stage 3 clutch is too much, found that out at Bug In #32, snapped both SAW axles, blew apart two bus CV's on two different launches at the same race. I need a strong clutch to hold back the extra power for the new NOS unit. I am fabricating an anti-shocker, much like Muffler Mikes unit to take care of the shock load of the clutch engagement. Someday when the engine comes compleatly apart I will go with a double disc clutch using a stock pressure plate. The bugs weight with me is 2040 pounds when I did 10.90's. Now with lexan windows, dry cell battery, and a ten pound NOS bottle the weight is around 1980 to 2000 pounds. The turbo hangs 5/8" too low so I keep the oil level at the bottom mark on the dipstick, use a AN-3 oil feed line, and the drain back to the sump is a AN-10, it works. The turbo is mounted from a 2" angle steel off the #2 exhaust studs, the helicoil in the universal case and of course the header flange. If you want to see more sport compact drag racing on the web, check out sportcompactdragracing.com. For the best in import and sport compact drag racing! If you'd like to see Robert's car at the dragstrip, he's on a number of videotapes at Ocean Street Video.